川普在联合国晒成就，引起嘲笑。 - 国际政治 - 小木猫 - Powered by Discuz! 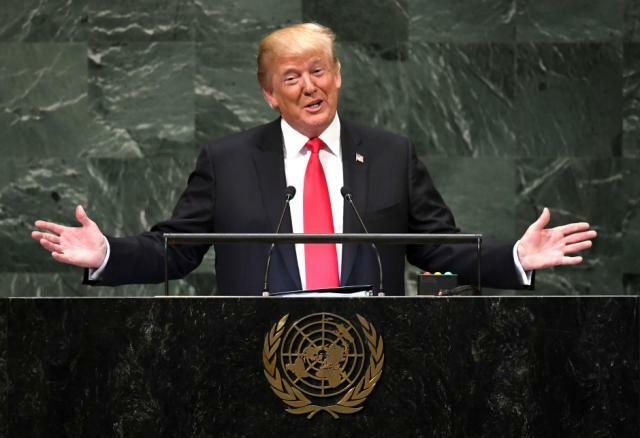 important]President Trump on Tuesday strode to the podium at the United Nations General Assembly in New York City to “share the extraordinary progress” the U.S. has made during his time in office. The reaction he received from the assembled world leaders wasn’t what he was expecting. “In less than two years, my administration has accomplished more than almost any administration in the history of our country,” Trump proclaimed. There was a smattering of audible laughter from the assembled diplomats, representing 193 countries. The president paused his prepared remarks. More laughter and applause followed. Trump said that under his leadership, major threats to peace — including North Korea, Iran and ISIS — have been diminished. “We believe that when nations respect the rights of their neighbors and defend the interests of their people, they can better work to secure the blessings of safety, prosperity and peace,” he said. “The missiles and rockets are no longer flying,” Trump said. Later, when asked by reporters about the laughter his speech received, Trump insisted the part that drew the chuckling was meant to be funny. "Did not the Expect that Reaction But that's Okay" Dear @realDonaldTrump, you are speaking to a room of intelligent, well informed world leaders who aren't subject to rhetoric, propaganda and hyperbole. This is not one of your rallies! SURPRISE! This is not your red neck rally!